Love the "Prima" bling scrolls, but hate the price? I know I do, and I seem to want to use the bling on every layout I make, which can be a little expensive after a while!! 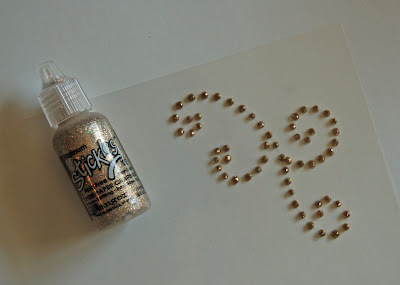 So, I decided to try a little experiment on making my own "Bling Scrolls" with a transparency, some "Stickles", and a little doodling and I came up with a really fun way to make your own bling embellishment. You're going to need a heavyweight transparency--you can buy these at an office supply store, or use the clear transparency paper that comes in your embellishment packages (REUSE, RECYCLE!!) 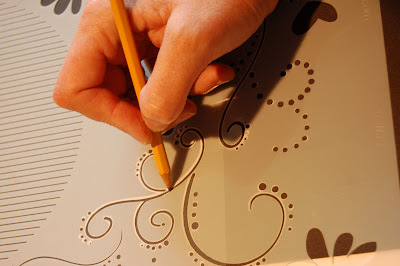 On the transparency, lightly trace a doodled stencil or freehand draw the shape you want your scroll. Next, using your Stickles, make dots along the lightly traced scroll, being sure to bring the dots close enough together, but not touching. Let dry at least 2 hours before trimming around the shape of the scroll--attach with vellum tape or mini glue dots and you now have your own "bling" scroll that looks like you spent lots of money on!! Thanks for this great idea. I know I can use this AND save the bucks! I LOVE this idea..thanks SO much for sharing. I woul dhave never thought of it. What a great technique...TFS. How could I print the sketches in your slide show? Are they for everyone to use? WOW....what a great tip!!!! I am so going to do this!!! Thanks!!! Great technique Kary! I'm definately trying this one out! Great idea!! I am so going to do this! This is by far the best technique I have seen in a while. Love those Prima blings, but who can afford to buy them all? 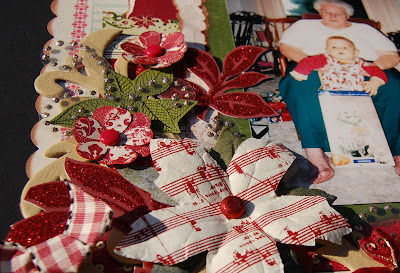 I just made a layout with using this....LOVE it!! !